Professor, Head, Department of Molecular Medicine and Biology, Jaslok Hospital and Research Centre, Mumbai 400026, India. 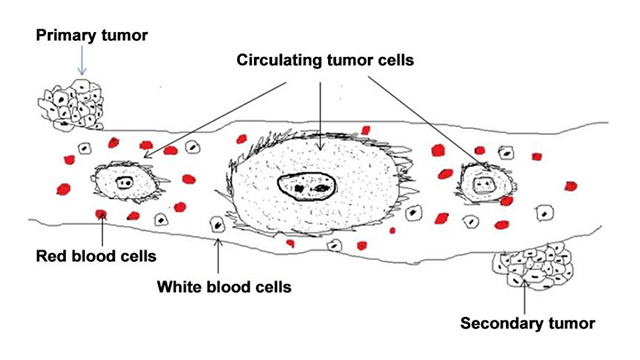 Major cause of relatively high mortality in cancer patients are due to the dissemination of tumor cells from primary tumor to distance organs which cannot be detected early by present imaging technology. However, one of the most promising development in cancer diagnosis & therapies is an introduction of Circulating Tumor Cells (CTCs) as a minimally invasive technology for monitoring the therapies of metastatic cancers. CTCs are originating from shredding of solid tumor cells in blood circulation and represent the tumour counterpart in vivo. 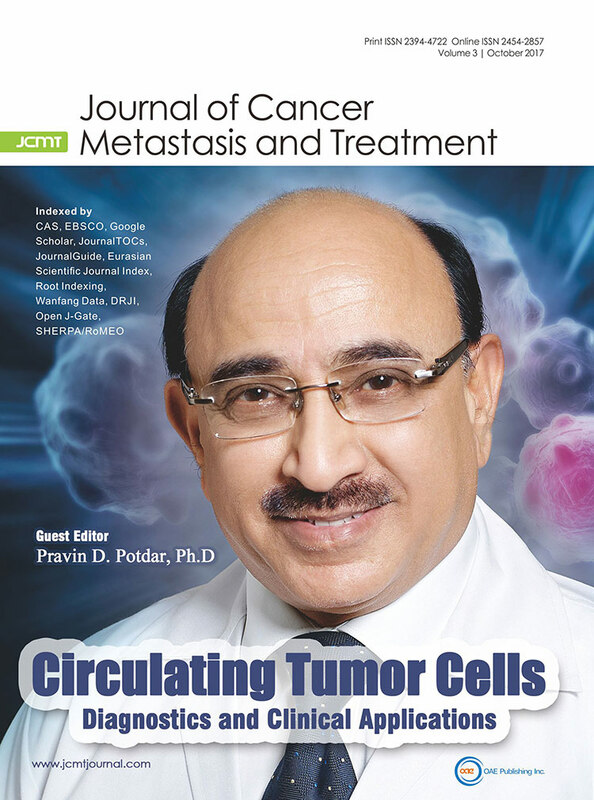 Enumeration and molecular profiling of these CTCs in peripheral blood of metastatic cancer patients allow clinicians to monitor intensity of metastasis cancer along with tumour cell phenotypes for using molecular targeted therapy for better cure. These liquid biopsies allow the characterization of specific biomarkers of CTCs in metastatic cancer patient more precisely than the old method of histopathology of biopsy specimen. Therefore this technology may revolutionize cancer detection and possible therapies for metastatic cancer in near future. However, it remains technically challenging because of very low concentration of CTCs in blood stream of cancer patients and there is a need for establishing well standardised protocol for enumeration of these CTCs according to their original phenotype. Molecular characterization of CTCs is one of the most active areas of translational cancer research and soon, CTCs characterization will contribute to have very specific targeted therapies for metastatic cancer patients and become the hallmark of Personalized Medicine. This special issue on “Circulating Tumor Cells: - Diagnostics & clinical application “ mainly discusses an important technical and theoretical aspects of CTCs technologies, including validation of enumeration of CTCs protocols and establishment of various biomarkers involved in cancer development by innovated molecular technologies. It also further evaluates an exact mechanism of metastasis process of various cancers for more specific treatment and cure of this disease. J Cancer Metastasis Treat 2017;3:23-33. Aim: Circulating tumor cells (CTCs) are crucial to tumor metastasis and valuable for prediction of clinical outcome in patients with solid tumors. Here, the authors aimed to establish a method for enumeration and characterization of CTCs from liquid biopsies. Methods: Peripheral blood mononuclear cells (PBMCs) were separated from blood samples from patients with metastatic cancer using Ficoll-Hypaque gradients and cultured to isolate and enumerate CTCs. 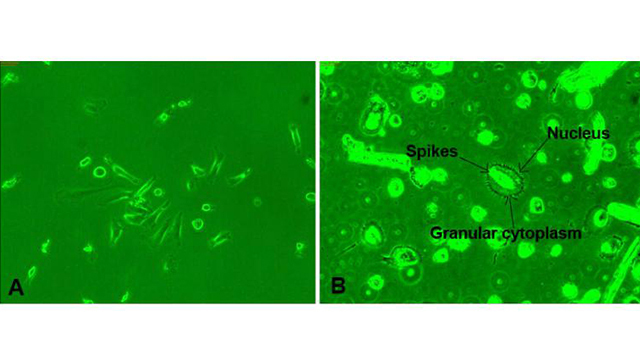 Cultured CTCs were morphologically characterized by light and phase contrast microscopy. The tumorigenicity of Ficoll-Hypaque-separated PBMCs was examined, in addition to their expression of mRNA metastasis markers. 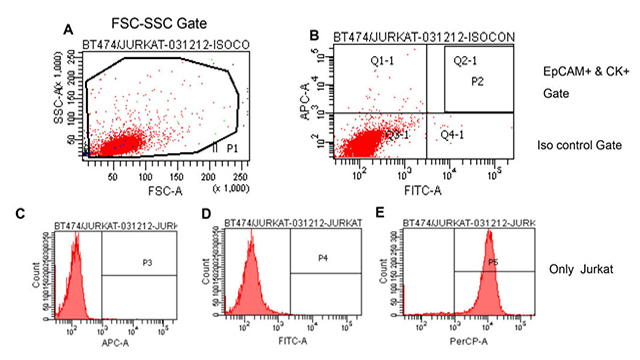 Results: CTCs were isolated in culture and enumerated by counting under phase contrast microscopy, demonstrating that 0.01-0.04% of total PBMCs were CTCs. CTCs were dormant, with large, oval-shaped, spiky morphology. 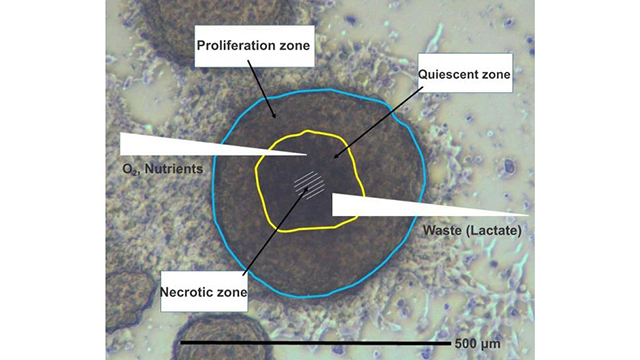 PBMCs obtained from liquid biopsies exhibited anchorage-independent growth, forming numerous colonies in soft agar assays. Molecular profiling demonstrated expression of several metastatic genes, but not of cadherin 1 (encoding the adhesion protein), in all patients. Conclusion: The authors successfully isolated, enumerated, and characterized CTCs from liquid biopsies of metastatic cancer patients. This study has potential to facilitate the development of new diagnostic and therapeutic methods using liquid biopsies, for application in metastatic cancers. J Cancer Metastasis Treat 2017;3:6-15. Aim: A “seed” of lung cancer metastasis is circulating tumor cells (CTCs), which may be dislodged from a tumor during biopsy. This possibility was assessed among patients who underwent lung tumor biopsy using flexible fiber-topic bronchoscopy (FFB). Methods: The study involved six patients with non-small cell lung cancer who underwent FFB biopsy to diagnose a lesion pathologically (5 males and 1 female, median age 63 years, 6 adenocarcinomas, of 4 clinical-stage IA, 1 stage IB, and 1 stage IIIA), CTCs were extracted from the peripheral vein blood at pre-FFB and at post-FFB using a size selection method. Results: No tumor cell was detected at pre- and post-FFB was in three cases (50%); no tumor cells were detected pre-FFB while CTCs were detected at post-FFB in two cases (33.3%); and CTCs were detected at pre-FFB with numerous CTCs detected at post-FFB in one case (17.7%). In addition, similar tendencies were observed in each analysis of single-cell and clustered-cell categories. 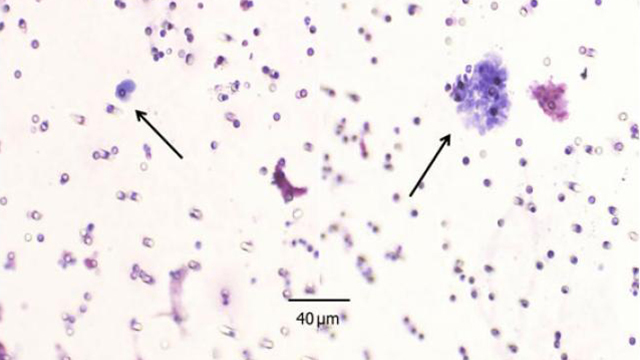 Conclusion: These results suggest that a FFB biopsy of lung cancer may potentially dislodge CTCs from a tumor into the circulating peripheral blood. J Cancer Metastasis Treat 2017;3:16-20. J Cancer Metastasis Treat 2017;3:1-5. Primary malignant circulating prostate cells (CPCs) are those detected in blood before definitive treatment for prostate cancer. CPCs can be detected in men with benign prostate disease; however, some methods to distinguish between benign and malignant prostate cells have to be validated. This study presents a review of the subject, including theoretical considerations for the selection of markers to detect them, the different methods used, and the utility of their detection in identifying men with prostate cancer and as a prognostic factor. J Cancer Metastasis Treat 2016;2:453-62. Despite the fact that the majority of cancer patients succumb to metastatic disease, most aspects of tumor metastasis are not understood in detail at present. Cell biologic steps of dissemination are difficult to characterize in human tumors and research is in large part confined to cell line and experimental animal studies. Epithelial-mesenchymal transition (EMT), intravasation of malignant cells, dissemination as circulating tumor cells (CTCs) and eventually mesenchymal-epithelial transition (MET) at distal sites are steps believed to be involved in metastasis. Small cell lung cancer (SCLC) is distinguished by early dissemination and excessive numbers of CTCs, which allowed for the ex vivo expansion of six permanent CTC lines taken from relapsed patients. Cells exhibit an epithelial phenotype with partial EMT traits and are chemoresistant due to formation of large tumorospheres. Since cells may have invaded without undergoing EMT, the role of MET is uncertain. These SCLC CTC cell lines seem to represent the metastasis-inducing cancer cells; these are the minute subpopulation of CTCs capable of surviving in the circulation and transitioning to metastases, leading in turn to resistance and failure of therapy. Full characterization of these lines is expected to provide the markers to find the relevant CTCs among the highly heterogeneous population observable in the context of tumor recurrence. J Cancer Metastasis Treat 2016;2:446-52.